It’s nice to give our travelers a break from their day to have some fun. We work really hard for our travelers, but we like to play too. 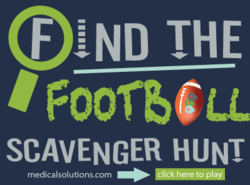 Medical Solutions, a leading travel nursing company, is excited to launch the first ‘Find the Football’ Scavenger Hunt on their website. To kick off football season, participants will search MedicalSolutions.com hoping to find 15 hidden footballs. For each football they find, their name will be entered once into the drawing. Prizes awarded will be a $200 and $50 gift card to footballfanatics.com. Medical Solutions is a leader in social media and contests in the travel nurse industry. “It’s nice to give our travelers a break from their day to have some fun. We work really hard for our travelers, but we like to play too.” said Jeannie Holmes, the Marketing Specialist for Medical Solutions. The Omaha company also was the first in their industry to launch a Pinterest Contest in June 2012. The scavenger hunt runs from Wednesday, September 5th until Tuesday, September 11th, 2012. All healthcare professionals are encouraged to play, even if they are not currently working with Medical Solutions. Please visit http://www.medicalsolutions.com/findthefootball for official rules and to enter the scavenger hunt.